C. Peter is the Founder and President of Global Bridges Network, China Bridge and Global Community Outreach, all headquartered in Ann Arbor, Michigan. China Bridge is a multi-faceted international business growth and development company and an Affiliate of the Global Bridges Network. China Bridge is focused on assisting clients to bridge the cultural, business development and operational challenges that confront competitors in the global marketplace. China Bridge works with U.S. companies currently doing business in China or with a strategic interest in expanding into Asia and Chinese companies investing in or otherwise entering U.S. markets. Theut authored the chapter “Practical Considerations for Doing Business in China in the Aspatore publication entitled “Best Practices and International Business Transactions in China”. In his capacity as the Founder and President of Global Bridges Network, Theut has expanded the scope of the successful China Bridge model now to include Network Affiliates with experience doing business in Korea, Africa, Mexico, Brazil, Japan, Russia and Sweden. Theut was a shareholder at Butzel Long prior to his retirement from the firm after a distinguished career practicing International and Maritime Law. While at Butzel Long, Theut chaired the firm’s Global Trade and Transaction Practice, the firm’s China Initiative and served as a member of the Executive Committee of the China Alliance. He also chaired the firm’s Admiralty Practice Group and has considerable experience in matters involving the treaties, international laws and governmental regulations related to the global maritime industry. Theut is Founder of Global Community Outreach, a non-profit organization also headquartered in Ann Arbor that functions in coordination with Non-Governmental Organizations worldwide to provide humanitarian assistance to needy parts of the world, with particular focus on remote parts of Africa, China and Mexico. With respect to worldwide rendering of humanitarian assistance, Theut has experience with the chartering of ships, delivery of product to remote ports throughout the civilized world and utilization of modified shipping containers for temporary shelter and emergency hospital relief in distressed areas of the planet. In addition to his China and overall international expertise, Theut has extensive experience with the financing, environmental and commercial aspects of waterfront development. With respect to his knowledge of Admiralty and Maritime law, Theut was Editor-in-Chief of the one-volume treatise, “Recreational Boating Law”, and serves as an Arbitrator and Member of the National Advisory Board of the Maritime Arbitration Association. He also was the Founder and a Past Chairman of the Recreational Boating Committee of The Maritime Law Association. While practicing Admiralty Law in California, immediately after graduation from the University of Michigan Law School in 1963, Theut practice with an Admiralty firm in Los Angeles that represented the foreign and domestic underwriters that insured vessels actively involved in the fishing fleets operating out of San Pedro and San Diego. While practicing in California, Theut also represented various warehouse and stevedoring operations on Terminal Island and the port of Long Beach/Los Angeles. Upon returning to Michigan, Theut joined the long-established traditional admiralty law firm of Fosters, Meadows and Ballard. He originated the “Recreational Boating Practice” in Michigan and at one time in his career represented a significant number of recreational marinas and commercial marine terminals throughout Michigan and the Midwest. While a partner with Foster, Meadows and Ballard, Theut also represented numerous Protection and Indemnity Clubs (“P&I Clubs”) headquartered in London, Europe and elsewhere that insured the foreign vessels navigating the Great Lakes. 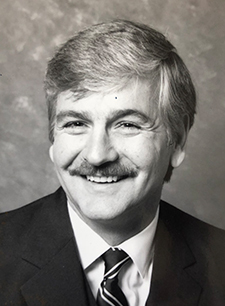 Theut also served for many years as General Counsel for the Michigan Boating Industry Association and General Counsel for the National Marine Bankers Association. In the latter capacity, Theut was a recipient of the “Bill Otto Industry Service Award” for outstanding contributions to the Marine Lending Industry. University of Michigan in Ann Arbor, B.S. Theut frequently conducts seminars in areas of his expertise and regularly lectures at colleges and universities on global trade issues and Admiralty and Maritime Law. He serves on the Advisory Boards of the University of Michigan’s Confucius Institute, the Detroit China Business Association, the Wayne State Law School International Law Program and the Board of Visitors of the Wayne State University College of Liberal Arts and Science.